Taming Pandaria #7: Showdown at the Vale of Eternal Blossoms! This last Tamer is tough, but gimmick-free. It can be fun to try and peel back the fight and find out on your own what works for you. Here’s what I’ve come up with, but there’s more than one way to handle this fight! She’s got the cool pets and a sweet umbrella! Aki the Chosen is, apparently, guardian of the Giant Pond of the Emperor. She’s also keeper of the Ultimate Bag of Shinies, and defeating her unlocks the daily quests. The good news is, you don’t have to take over her job guarding the pond. The bad news is, even if you win, you still have to find your own Sweet Umbrella. 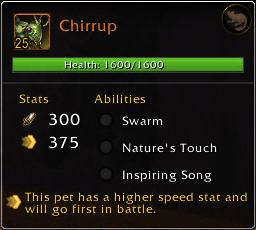 Chirrup has two very strong heals and one attack: Swarm. In case you haven’t figured it out, you need a pet with a shield ability to take him down. It also should also hit hard enough to out damage his heals. An Aquatic pet with a Beast ability, like a Crab or Turtle, is ideal, though other pets will work. One time, just for kicks, I brought a Level 14 Crab with Sandstorm up from another pet, and it was actually able to kill Chirrup. It took forever though. She’s a lightning fast killer! Stormlash is a Dragonkin, which you haven’t seen in a long time. She also has one ability, Call Lightning which I hadn’t seen before the first time I fought her. Call Lightning hits your pet with a large amount of Mechanical damage and then add extra Mechanical damage to each attack you do. If she is slower than your pet, this makes her (already strong) Tail Sweep hit extra hard. It also makes her very vulnerable to Swarm attacks. A pet with a shield ability or a weather effect can completely mitigate her Call Lightning ability as well. It’s your call how you want to take her on, but avoid using Magic, Beast or Flyer pets. 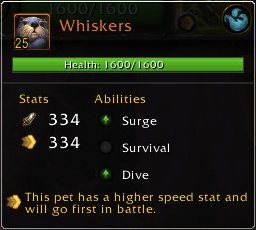 Whiskers is there to keep you from winning the fight by just ganging up on the first two pets. You need a third pet that matches up well to finish him. Whiskers also has the nasty habit of stringing together Survival with Dive and turning a close win into a close loss. 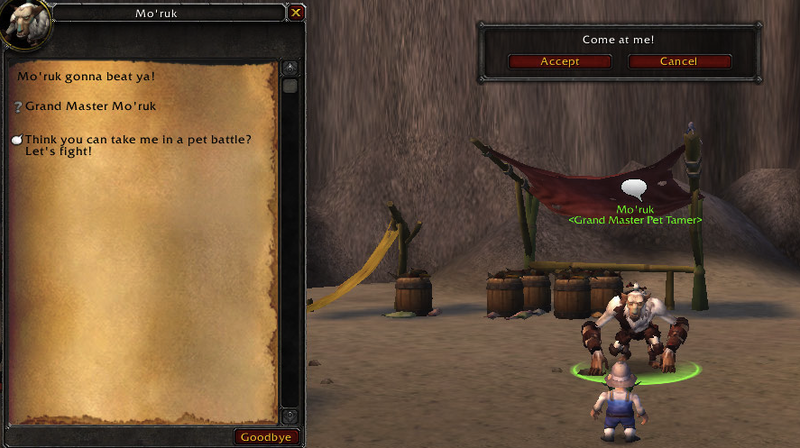 A Flyer works well (obviously), though a “tanky” pet with a heal can also wear down Whiskers. Again, it’s your call, but don’t think the fight is won just because you managed to finish off the big scary Dragon. 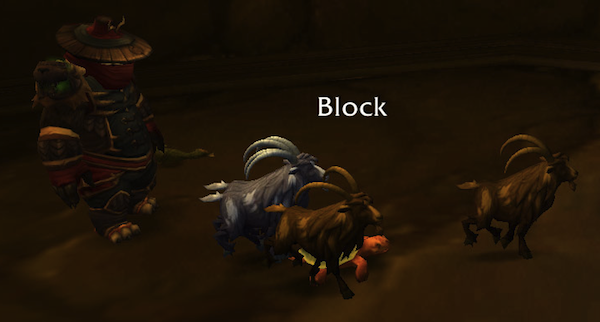 In summary, you need a blocking pet if you want to win. There are many different ways of taking down the Dragonkin, and that’s the hardest part of the fight, but you still need a good pet left over if you want to finish of Whiskers. 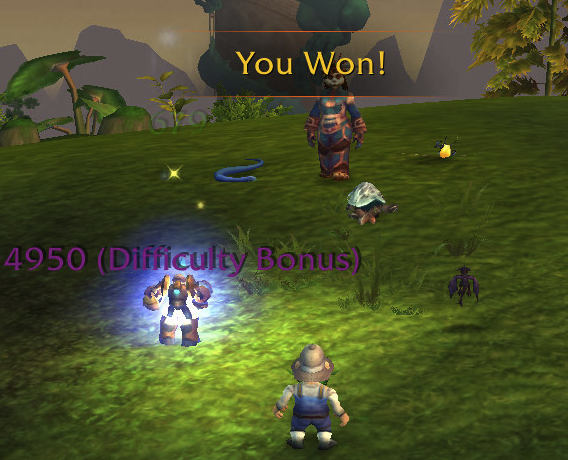 Congratulations, you just finished Taming Pandaria! This fight can be used for leveling fairly easily. You can even start with a Level 2 or so as long as it isn’t accidentally killed by the first pet’s Swarm. Hands down, the best pet for this fight is Anubisath Idol. 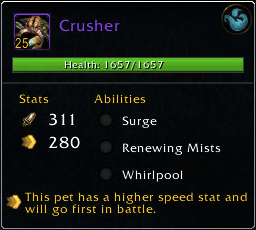 Just pick Crush, Sandstorm and Deflection and you can slowly wear down the first two pets by yourself. If you don’t have that pet (yet), you can still break it down using a Crab or Turtle with a Beast attack, a shield, and a heal to finish off her Critter and Aquatic pets. That leaves you with a few options for the Dragonkin. You can use a swarming Undead (like the Infected Squirrel) and that should be able to solo the Dragonkin even if it dies by the end of it. If you have a hard hitting Humanoid, like the Pandaren Monk or Peddlefeet you should be able to take the Dragon down without dying. A pet with a weather effect or a shield can also cancel out the extra damage from the lightning storm, but Stormlash will still hit hard, especially if she attacks second. 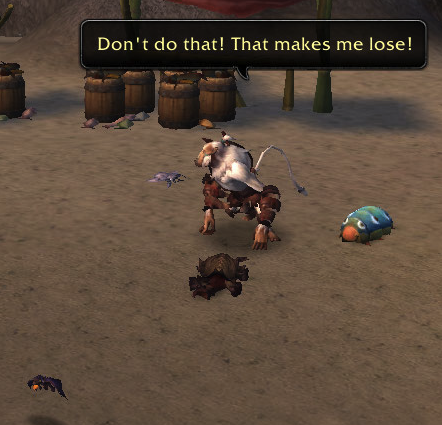 Congrats on Taming Pandaria! (even if you’ve done so a long time ago). Welcome to the Dread Wastes! Home of the giant bug people! Well, the other giant bug people. Meet the “Undefeatable” Wastewalker Shu. You know, I don’t think that word means what you think it means! 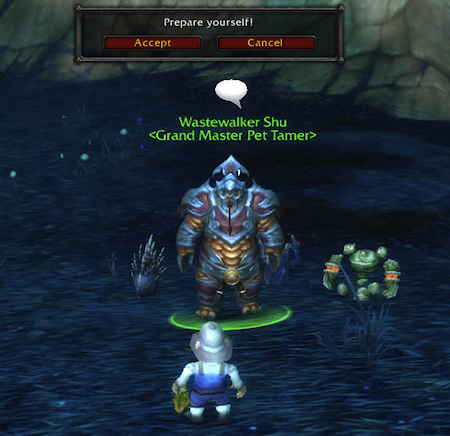 Wastewalker Shu has, allegedly, been scouring the wastes in search of the perfect pet team. Which is much more effort than the last couple of Tamers. On the other hand, most of those pets he found are found, like, right near the edge of the wastes. So maybe it wasn’t as much work as he thinks it was. Except for the Elemental. That one’s a pain to get as you have to defeat its current owner. He wants to crush you, but his owner won’t let him use his claws! Crusher is a giant crab. He has a heal (Renewing Mists) a charging Aquatic attack (Surge) and a big Aquatic attack that hits after a few turns (Whirlpool). As long as you can out damage his heal, he’s not that tough. 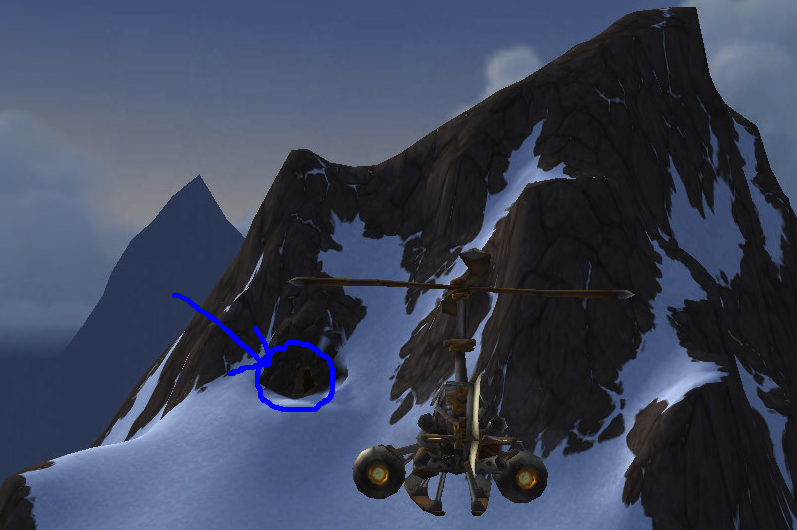 You can put a Flyer on him and try and time Lift-Off so that you don’t get hit with Whirlpool or you can put a different strong DPS pet, a Magic or Dragonkin with Tail-Swipe works well. Sandstorm lasts 9 rounds and reduces the amount all of your attacks hit for. It will completely blocks attack like Swarm. However Pounder, being an Elemental, doesn’t actually get to enjoy that effect. 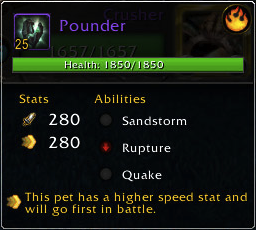 The obvious choice to take down Pounder is a hard-hitting Aquatic pet, like the one you used to finish off the last Tamer. If you can, you should probably let your first pet stick around for the first round instead of swapping. This is so your Aquatic doesn’t get hit with a ton of Flying damage from Sandstorm. You should try and time any Avoidance abilities around the next Sandstorm though it may take some practice to get it right. If your pet also has a weather effect, that can make the fight a bit easier, but it’s not strictly necessary. Yet another Spiky Ball of Death! Mutilator doesn’t have any unusual abilities. 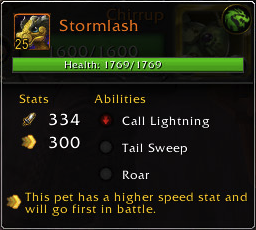 He just hits like a truck against most pets. He has a Spiked Skin which reduces the damage he takes (and also combines with any lingering effects from Sandstorm). His main attack is Powerball which does Critter damage and makes him super fast. He occasionally throws in a Counterstrike which does Humanoid damage that Dragonkin need to watch out for. A hard hitting Mechanical can make this last guy easy. A Dragonkin with Tail-Swipe works well (if you can avoid Counterstrike), as does a Humanoid that does non-Humanoid damage. Flying pets don’t have their usual advantage and Undead pets should be careful. Any other strong DPS should do okay. In summary, if you have a strong Aquatic pet that can beat up his Elemental, you’ve got the fight mostly finished. 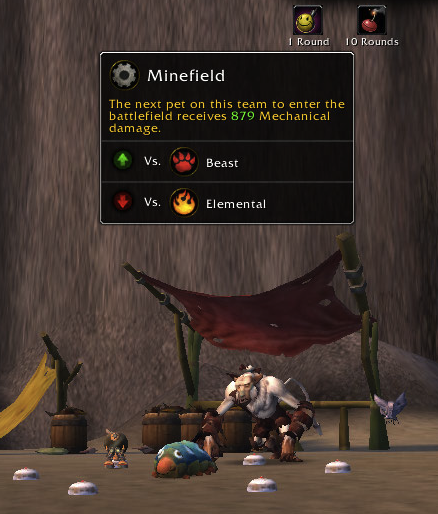 Matchup the other two pets and time your abilities correctly, and the fight isn’t too difficult. If you have trouble, remember, the stable master is nearby. 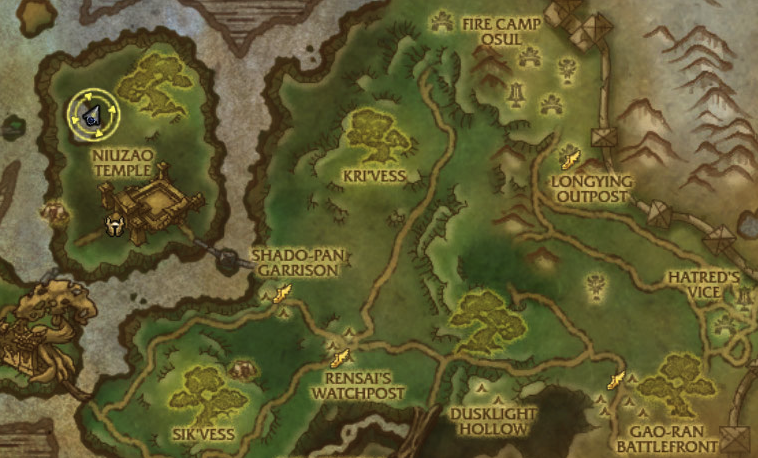 Depending on your stable, using this fight for leveling purposes can be more involved than you’d think. 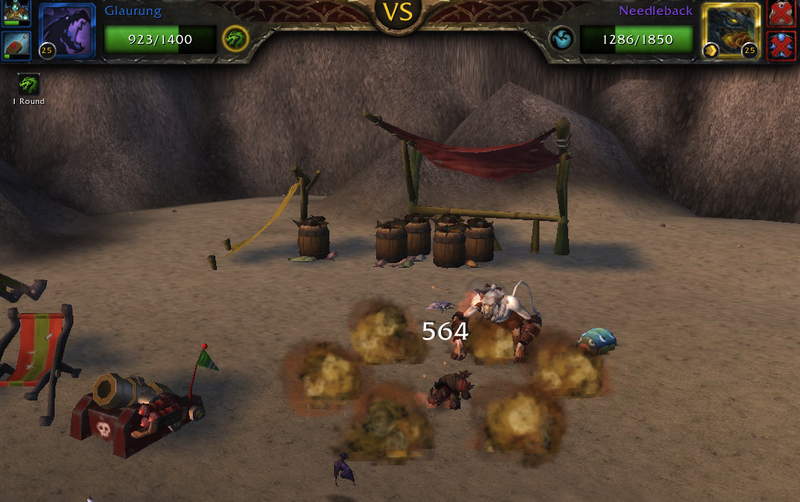 His pets do a ton of damage and you need to mitigate that enough for your two Level 25s to take out his team. You can lead with most low level pets, as his Crab usually casts its heal on the first turn. However, your pet will take some damage from his Earthquake attack, and Beasts will take extra damage, so you may need to be at least level 10 or so. While I’m sure there is more than one way to take out this guy, my two pets are usually a strong Aquatic DPS (like a pump pet) and the good old Spawn of Onyxia with Tail-Swipe, Lift-Off and Healing Flame. You should swap in your Dragonkin against the Crab. Your main damage will come from Tail Swipe. You want to let the first Whirlpool it casts hit and use Healing Flame to get some of your health back. 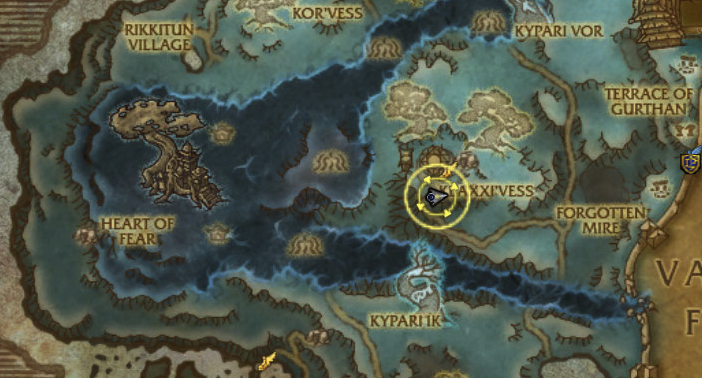 You should save your Lift-Off to avoid the second Whirlpool and ideally the Crab should be dead shortly after that. Let your Dragonkin take the (reduced) Flying damage from Sandstorm and use your Healing Flame again. Then swap in your Aquatic pet and beat up Pounder. You should most likely swap in your Spawn of Onyxia to beat his Spinny Death Ball using Healing Flame and Lift-Off to mitigate the damage from Counterstrike. Ideally, your Dragonkin can take the last pet on its own, but if not, your Aquatic should be able to finish Mutilator. 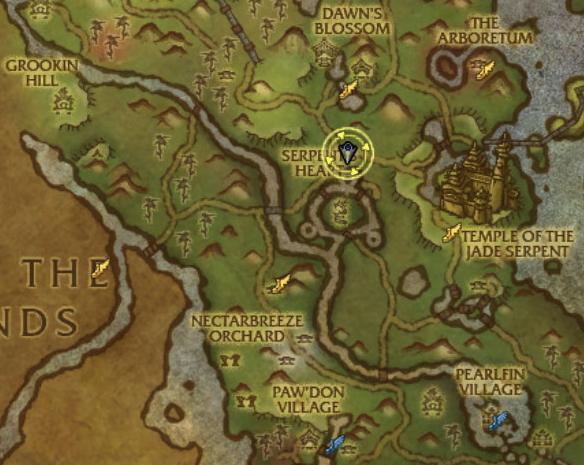 This patrol is in a very awkward location. 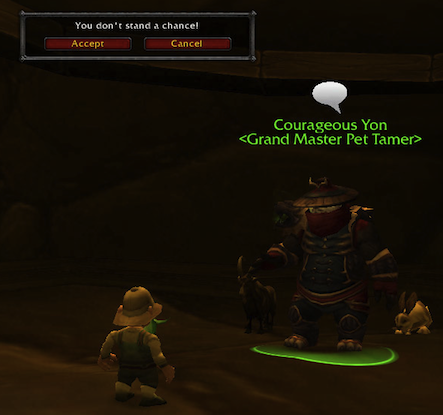 Also, he respawns quickly enough that you might want to dismiss any pets. That’s what they all say, Seeker Zusshi! Seeker Zusshi is certainly confident. Apparently staring at a big pool of water day-in, day-out makes you very good at pet battling. Actually, the rest of the tamers are exactly like him, though they give their own quirky reason why they’re the unique snowflake that you won’t ever defeat. Let’s show this one we mean business! Speaking of unique snowflakes, here’s Diamond! Diamond is a pretty tough Elemental. 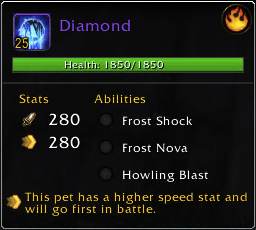 Not nearly as bad as the ones in Deepholm, but between her two Freeze abilities and her Howling Blast you can take a large amount of damage. As with most Elementals, the answer is Aquatic damage! Mollus is just like every other snail. Maybe he hits a little harder but the main problem with him is the self heal from his Absorb ability. Fortunately, it hits less on Aquatic pets, so an Aquatic pet that does Beast damage, like a Turtle, is your best option. Skimmer is what keeps this fight from being too easy. He takes a bit to ramp up, but his large damage attack, Pump takes out huge chunks of your health. And he manages to Soothe you to sleep so that you have difficulty avoiding that damage. You would think that the best way to counter Skimmer is by using an Flying pet and burning him down. But the best option, in my opinion, is to bring in another pet with Pump, only make sure and prime your pump on the previous pet so that you’re ready to bring the pain as soon as Skimmer shows up. You should be able to get at least two pumps off before he kills you, and if you have any pets at all alive at that point, Skimmer will be easy to finish off. If you don’t have an Aquatic pet that works, the next best is likely a Magic pet, as that will mitigate alot of the damage from Pump. 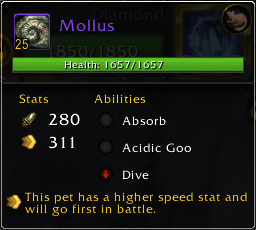 If you don’t have one of those leveled, just bring your highest DPS pet in and hope for the best. In summary, this is a fight where it’s best to fight fire with fire, or rather water with water. If you’ve got two good Aquatic damage pets, especially one with Pump, this isn’t too difficult, otherwise you might have to work a bit to finish him. This fight can be easily done for leveling purposes, if you have the right pets. You will likely want to swap in your leveling pet to take one of the Acidic Goos off the second pet. 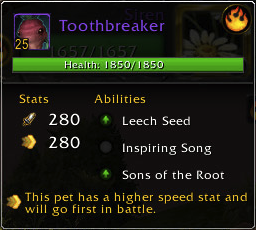 Your first pet should be something with very strong Aquatic damage. I’ve had good luck with everything from a Water Waveling to Legs. A double Pump team is ideal. Your second pet should be a Turtle or a Strider. The one I use most often is a Wanderer’s Festival Hatchling which is harder to get than most turtles, but has a Beast attack, a Heal, and Pump. 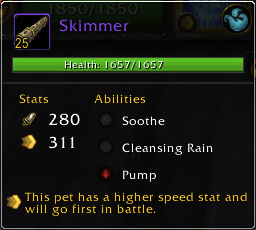 If your first pet is tough enough to take down the Elemental quickly, then the Heal is less important as you should get two Pumps off on the Strider pet and have your first level 25 take down the last 25% or so. This next guy isn’t nearly as annoying as the previous one. Although he makes up for it by being impossible to find! Hard to get to? You weren’t kidding! 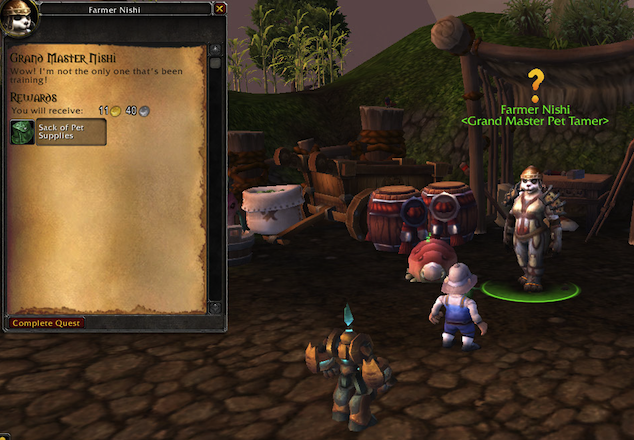 In fact, if you have the right set of pets, finding the dang Tamer can be more time consuming than the fight itself. He’s a Legend in his own mind. Or something. 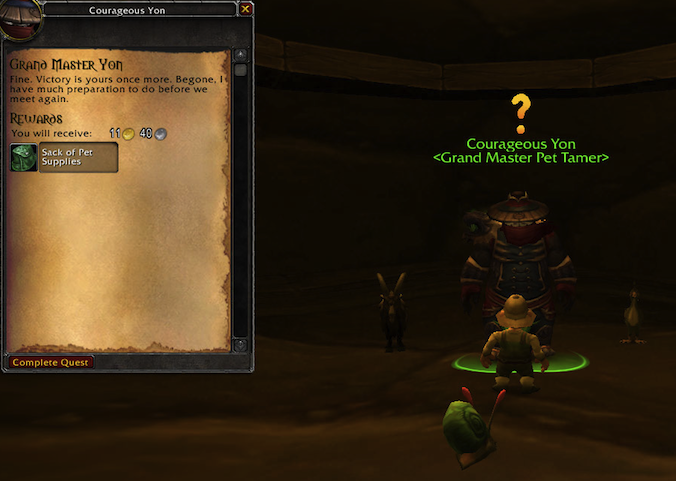 Courageous Yon seems to be kind of a big deal. Or at least, he claims to be this legendary tamer guy. Which begs the question, if you’re so awesome wouldn’t you have better digs than this lousy cave in the middle of nowhere? Oh well, maybe that just means his bag of shinies will be extra shiny. The fiercest chicken in Pandaria! Piqua is just like pretty much every other chicken you’ve fought before. She Squawks, she Flocks and she Lifts-Off the ground for a brief flight. Only she’s got tons of stats. Bring a pet with a shield ability (like this Emerald Proto-Whelp), and she’s EZ Mode. I mean, maybe you get hit by her Lift-Off for some damage, but that’s about it. He’s the most awesome Rabbit on this mountain! 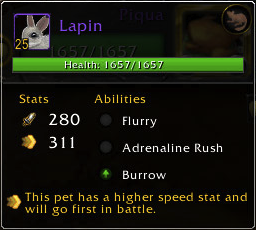 Lapin is just like every other rabbit you’ve fought before. While his Burrow can do some damage, if you have a shield ability, you can mitigate his other two attacks almost completely. Bring a pet with a shield that does Beast damage, like a Turtle or a Crab, and he’s EZ Mode. 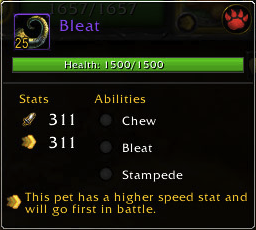 Bleat may be different from other pets you’ve fought before. At least as far as Tamers go. He usually starts with Chew. This ability lets him do an extra large attack on his next turn. Then he Stampedes you which gives you the Shattered Defenses (unless you have a shield ability). Then he takes a break and heals himself with Bleat. After that he Stampedes again, sometimes doing Chew first. If you have a pet with a shield ability you’ll only take damage from his Chew attack. If your pet can heal itself, you should be able to mitigate that without any problem. In summary, this fight is EZ Mode if you have one or two pets with a shield ability. 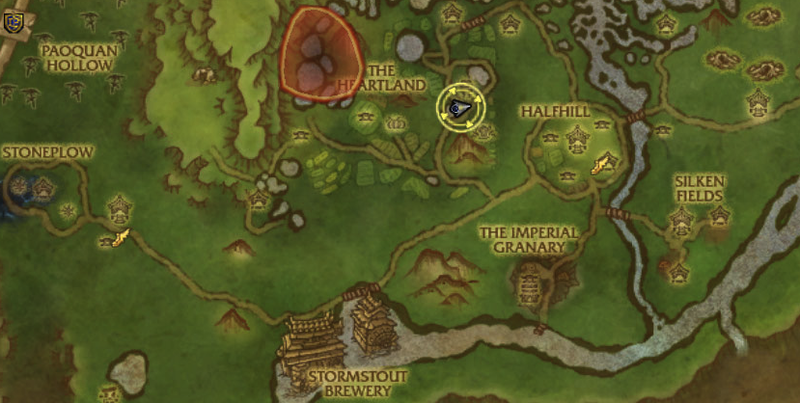 So hunt down those Crabs, Snails, Turtles, and/or Emerald Proto-Whelps if you haven’t already! 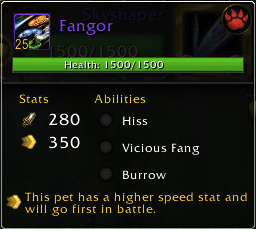 So did you get that hint about how you need pets with shield abilities if you want to win this? Was I too subtle? 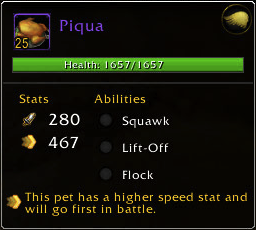 You can easily level any pet in this fight, even a Level 1 (as long as that Squawk doesn’t crit). 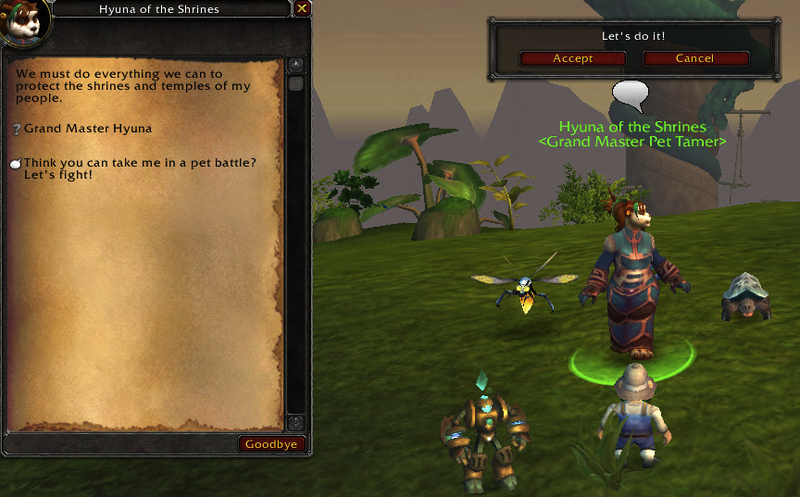 Swap your leveling pet in for your Chicken-killing pet, put up its shield and beat down that Chicken. You should likely play it safe and use any heals you have on every cooldown, but the most important thing is to keep that Shattered Defenses debuff from ever appearing, by keeping your shield up! You can swap in your second pet to take out the Bunny and it should go just as smoothly as the Chicken. The Mountain Goat might be a little tricky as Chew still does some damage, but he doesn’t always use it on every cooldown. As long as you have some self-healing, it should work. Of course, if that’s not easy enough for you, the perfect pet for this fight is: Anubisath Idol. With Sandstorm, the Humanoid Self heal, and Deterrence, he can take on all three by himself, though it takes much longer. Fortunately, Sandstorm lets you swap in any (non-Elemental) and it will still block those attacks as long as the weather ability is in effect. Okay, you do that then! What happens in the Krasarang Wilds, stays in the Krasarang Wilds! So this fight is definitely not EZ Mode. You’ll actually need to pay attention and use more than one pet if you want to win. So that’s good. Also, how annoying is it to try and type “Krasarang?” I kind of want to smack the person who picked that name. Then again, maybe they’re like 10 feet tall and can beat me up. Maybe that’s their Mother’s favorite word and they’ll have to duel me to the death for making fun of it?? Maybe I’ve been through the Wormhole Generator one too many times and my brain is permanently scrambled! Anyways, let’s talk about the tamer now. Mo’ruk is a giant Monkey-man who’s gonna beat ya! What’s extra sad is how many times you get ROFL-stomped by the Monkey-man while you’re figuring out what you need to do to finally ook him in the dook. Let me ease your pain somewhat and share what I’ve learned to consistently ook him. Whadda know, another giant caterpillar-thingy! Woodcarver is just like every other giant Caterpillar-thingy. Only with more stats. First, he hits you with his Acidic Goo which increases your damage taken by 25%. Then, he Burrows and hits you with an extra strong hit. Then he heals himself with Consume. At this point, your Acidic Goo needs renewed, so he does that. Then he either hits Consume or does nothing until he’s ready to Burrow. After a few attempts, you can usually guess the timing on him. So what do you do to stop him? Well, that depends on your stable. 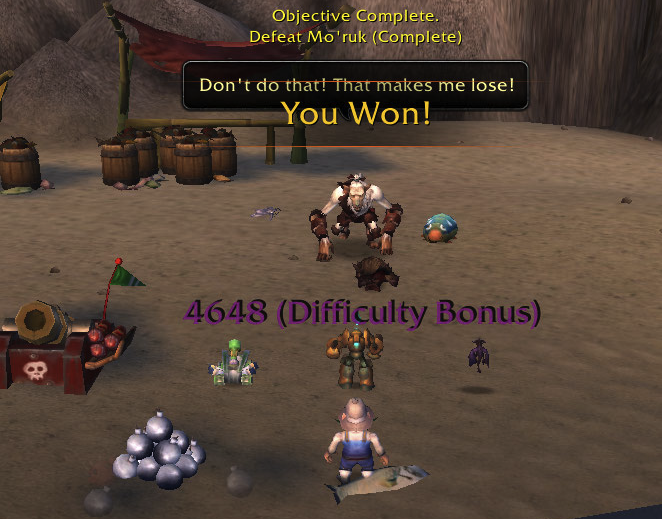 If you’ve got a Darkmoon Tonk, you set that up with Minefield and Lock-On, then you fire your Missle at him, trying to keep him over 50% health until his first consume. That way he doesn’t get extra heals from his Beast special ability. Then you fire your Lock-On and Rocket him until he’s dead. 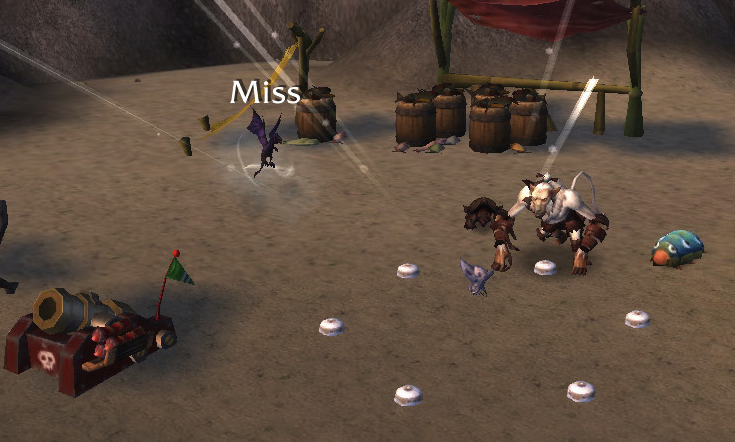 If you can, try and drop a second mine-field before you switch pets. What do you use if you don’t have a Tonk? Another good Mechanical, like the Squirrel or the Dragonling, should work. I’ve also had good luck using an Ooze as your Absorb and your DoTs do a good job of killing Woodcarver while still having a fair amount of health left. 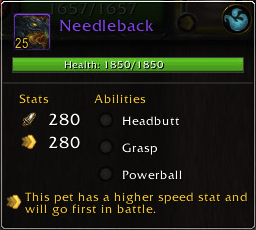 If you don’t have any of those pets, you can try and use the best DPS pet you have and hope it works. This is one giant moth, you wouldn’t want to find in your cupboard! Lightstalker hits even harder than the Giant Caterpillar-thingy. He’s got Moth Balls, Moth Dust, and Alpha Strike and they all sting. He doesn’t have any mitigation or avoidance abilities, so the best thing you can do is burn him down, and the best pet for that is a Dragonkin. Preferably, one that does magic damage, but any will do in a pinch. You can try and kill him with a Magic pet, or something else that has good mitigation, but it’s probably not any easier. He’s a spinning ball of pain! Needleback is fast and painful. He usually opens with Headbutt which is a Beast attack that can take 40-50% of your health. If you survive that, he uses Grasp to make sure you can’t leave, and then uses Powerball on you until his Headbutt is off cooldown again. You can try and use a Flying pet, since he is an Aquatic. This works pretty well, especially if you have Lift-Off or Cocoon as it keeps his Headbutt from hurting as much though it does nothing for the other two abilities. If you have a Harpy Youngling, that actually does well against him too. 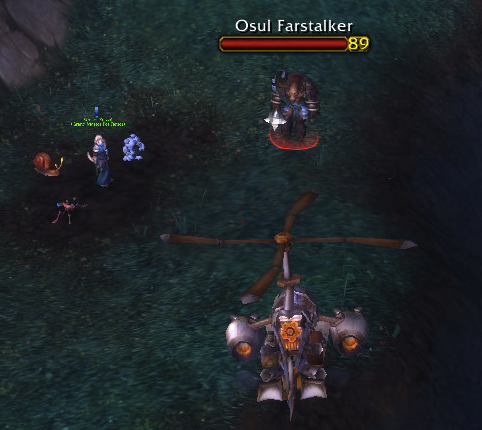 If all else fails, the Spawn of Onyxia with Tail-Sweep is a good choice as it can heal back the damage from Headbutt and it also has Lift-Off which does a ton of damage to him (when it actually hits). In summary, this fight is about matchups and to some extent, RNG. If you have a pet to counter each of his, you should be able to beat him. If you don’t, then maybe it’s time to go level or catch one! So this one took me awhile to figure out. I’m always tempted to try and tweak my strategy, as it’s still dependent on RNG, but every time I do, it keeps de-railing somehow. Assuming your pet is at least level 10, you want to open with it so that it takes the Acidic Goo from the Caterpillar and your first pet takes less damage. Your next pet should most likely be a Darkmoon Tonk with Minefield and Lock-On just like I mentioned above. I’ve done it with other pets, though they didn’t go as smoothly. Handle the Tonk pretty much exactly as I mentioned earlier and his Caterpillar should be dead after only 1-2 Consumes depending on RNG. If it takes longer than that, you’ll probably lose. If your first minefield misses when the Moth comes in, you may have trouble winning, but keep trying anyway. Don’t swap your Tonk out immediately, as you want it to lay down another minefield. Depending on how much health it has left, it may die after laying down the mines. If it’s already used its fail-safe, just let it die, otherwise swap it. Your next pet should most likely be a Spawn of Onyxia with Tail Swipe, Lift-Off, and Healing Flame. You need a Dragonkin to take on the second pet and still have enough hit-points to wipe out the third. The heals and avoidance make this pet work, though you can likely have a good chance with something like the Emerald Whelpling. 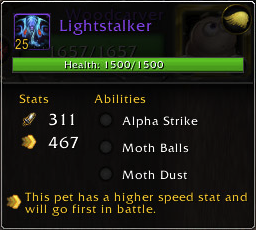 Not everyone has this pet, of course. You should time your heal so that it’s not immediately after a Moth Ball attack as the heal will be much smaller. Your Tail Swipe is your main DPS. You should try and time your Lift-Off so that you don’t get hit with Moth Balls as the Moth’s other big attack, Moth Dust has a higher chance to miss and you can always use Healing Flame to mitigate it. This may take some practice, but it’s no biggy if you can’t pull it off consistently. Any avoidance is still good. Another pro tip: if the Moth’s health is low enough to trigger your Dragonkin ability, it may be a good idea to not kill it on the next turn. Rather, you heal yourself or whatever and let your next (unbuffed) attack finish it off. This means your first attack on the Spinny Turtle guy will be extra hard. Whether you do this or not depends on how much health you have as well as the Turtle’s first attack hits very hard. If everything goes well, you should have around 60-80% health and so should the last pet. Use your heal whenever it comes off cooldown. You can try and time your next Lift-Off to avoid the Turtle’s Headbutt though that takes a little dumb luck as much as anything. If you’re lucky enough to have your Lift-Off damage him, you’re in good shape. If not, you can still kill him with Tail swipe just hope that you don’t get crit to death. If your leveling pet is too low to live through Acidic Goo, it’s doable, but more difficult. Bad RNG can derail this strategy, especially if Minefield doesn’t trigger, or your Tonk doesn’t kill the first pet fast enough, or your Dragonkin takes too much damage. Several bad attempts in a row can make this very frustrating. Don’t forget to breathe! So what do they do in the Valley of the Four Winds when they get bored with farming and fighting Virmen? Well they make their crops battle to the death! But it’s all in good fun. 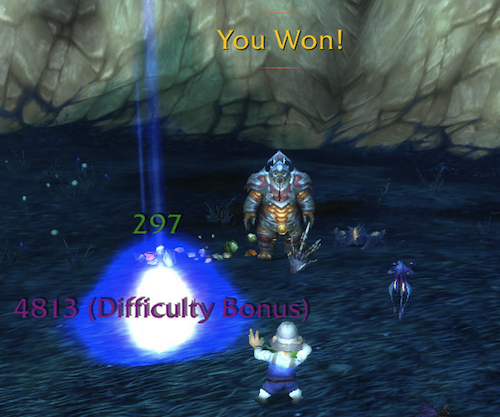 Also, since all they have are Elementals and giant Caterpillars, you end up with the easiest fight in Pandaria! 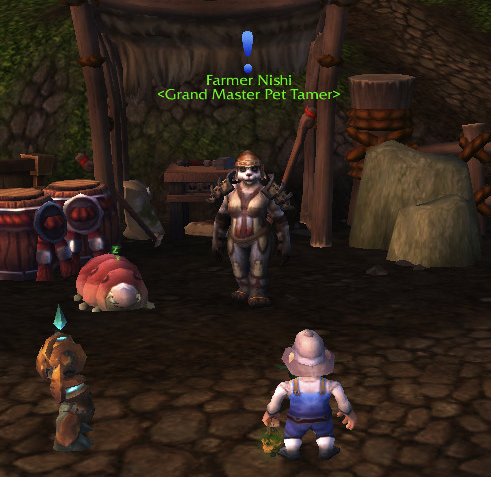 Farmer Nishi, meet Farmer Nik! 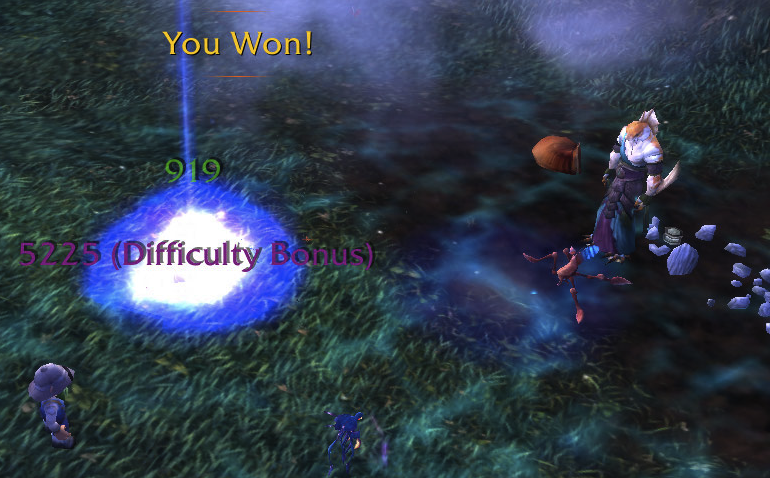 I may not have cleared a single raid boss this expansion, but I beat the pants off of WoW-Farmville! Farmer Nishi has a dream. A dream that some day, he’ll take on the best and the brightest in Azeroth and win! 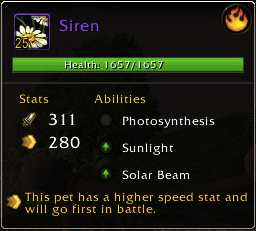 Unfortunately, Blizzard would have to completely eliminate the entire Aquatic pet class for that to work. Too bad, Farmer Nishi! So anyone here played Plants vs. Zombies? I have! And I heart (♥) you so much giant sunflower! Too bad I’m still gonna have to sic my Water Waveling on you until you’re dead! So yeah, blah blah blah, the Giant Sunflower uses her solar power (Sunny Day) to make everything bright and sunny. Then she uses her extra strong Photosynthesis to heal any damage your pet might do to her. Then she just sits there soaking in damage like a punching back for 5 turns until her solar power thing comes off cooldown. Unless of course you break out an Aquatic damaging pet. Then you hurt her enough that she dies slowly over about 4-5 turns. Look! Another Elemental!! Only this one hides in the ground while his little friends beat up on you. You can hide, but you can’t run Giant Turnip-Thingy! Hopefully, you’ve got the idea by now. Use your Aquatic damager and finish him off! What kind of name is that?? Well at least this one isn’t another Elemental. Instead, it’s a giant caterpillar. Which is just like all of the other worm thingies you’ve fought before. If you’ve got a Mechanical or a Flyer, use it. Heck at this point, you might try and work in a Critter just to keep it interesting! In summary, Water Waveling, Water Waveling, Water Waveling, Water Waveling, Darkmoon Tonk?? Eh sure, whatever. That was loads of fun neighbor! Thanks for the bag of shinies! Do we really need to do this? Okay! 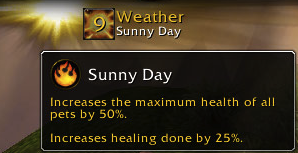 Well if you want to have maximum EZ Mode, open with your leveling pet, I think you can even use a Level 1, though if you’re unlucky enough to get two solar power things from the sunflower, it might accidentally die. Then bring in your Water Waveling (or other Aquatic damage pet), and drop Geyser to stun the first pet. Save your Frost Nova until the turn it goes off to keep the pet from running away. If either of those two attacks miss, well the fight might actually be a challenge. While you’re waiting for Geyser to finish, you can cast Water Jet and watch the Sunflower’s health bar shrink. After dispatching the Sunflower, you should be at 90% health (yes really). Cast Water Jet, drop another Geyser on the Turnip while it’s doing that hiding in the ground thing. And then make sure and cast Frost Nova to keep the other Elemental from running away. After this is dead, you’re probably at 25% health. Do the Water Jet + Geyser thing one more time. There’s a 90% chance that your first pet is dead. So use whatever your other level 25 to kill the giant Caterpillar. You want pet battles? We got pet battles!! 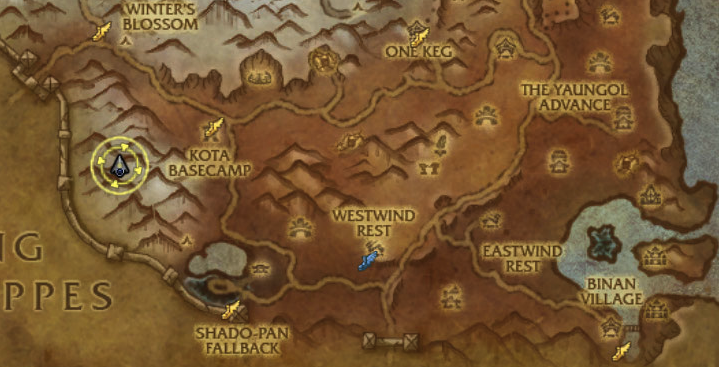 I think Blizzard decided to try easing us into the first few Tamers in Pandaria. Which is alright by me. If they were all like Major Payne or Crystalsong Creepy Guy I think I’d have rage quit by now. Just like the last tamer in Cataclysm, this fight is very straightforward but still a bit challenging since the gap in stats is even larger. Meet Hyuna of the Shrines. She’s protecting the Temples of Pandaria with her tiny pets! 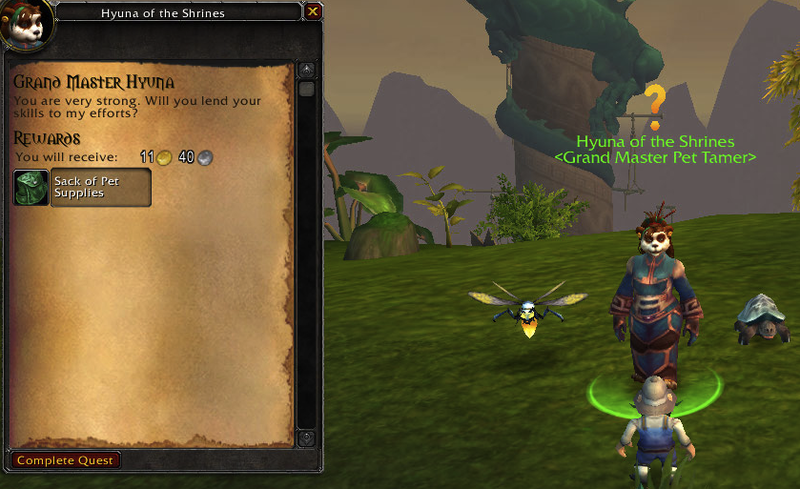 So tell me, Hyuna of the Shrines, how effective is your tiny Turtle in protecting the Jade Temple? What’s that you say, the Temple is overrun by giant Shadow things?? Well I’m sure that wasn’t your fault. Your Turtle did the best it could! She’s pretty tough for a flying insect. 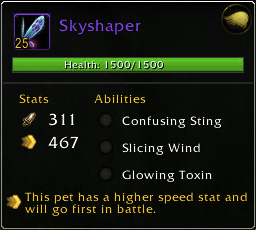 Skyshaper is pretty typical of the Flying insects in Pandaria. First she generally hits you with Confusing Sting which does a bit of damage every turn. Then she breaks out Glowing Toxin which takes 25% of your health over a few turns. Then she does a normal Flying attack (Slicing Wind) until the first two wear off and she starts all over again. She’s got no mitigation or avoidance abilities. She doesn’t swarm. Stick a Magic or Dragonkin pet on her and she’s EZ mode. Fangor is a typical Snake pet. He Hisses, Burrows and hits you with his Vicious Fangs. Break out a Mechanical or a Flyer, time your abilities around his Burrow, and he’s EZ Mode. That’s some name you got there! Dor the Wall keeps this fight from being boring. He starts out using Headbutt which hits for a ton of Beast damage. Then he heals himself with Healing Wave, rests for a few turns while putting up his Shield Shell, and starts it all over again. Depending on what pet you bring, Dor can be a complete pain as you can’t hurt him enough to come close to killing him. What do you do? There’s more than one way to take him on, depending on your stable. If you have two good Flying pets, you can stick one of them on the Beast, and the other to start wearing down Dor. Then use your second Flying pet (ideally a Moth with Cocoon Strike or a pet with Lift-Off ) to wear him down, timing your avoidance ability to match up with his Headbutt attack so you take pretty much no damage. As long as you use large attacks, like Peck, rather than Flurry like attacks, you should be able to wear him down. If you want it to be super-EZ Mode, you can use a Spawn of Onyxia with Tail Swipe (assuming your pet is slower than his), Lift-Off and Healing Flame. As long as your pet has enough health to survive the first Headbutt you can take him down completely and end the fight with nearly 100% health. 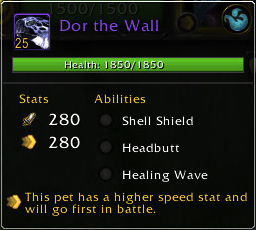 In summary, as long as you have the right pet to take down Dor the Wall this fight is pretty easy. If you don’t have any answer, you should probably spend some of your time capturing some of the cool pets in Pandaria and levelling them, as the later Tamers are much more difficult. First tamer down, six more to go! As long as you have a max level Spawn of Onyxia or a Dragonkin with similar abilities, this fight is probably easier to use for leveling than most of the ones in Cataclysm. 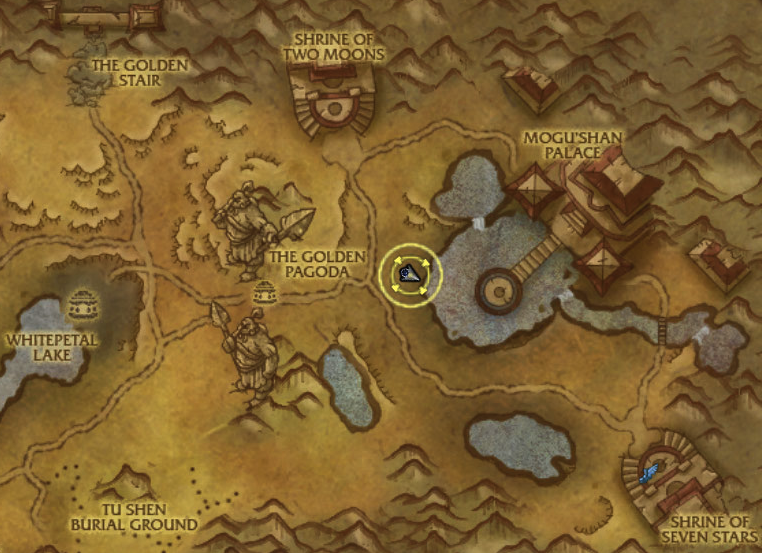 Just open with your leveling pet, and swap in your Dragonkin to finish off the Flyer. Then use whatever works against the Beast pet. If your Dragonkin has low health, then let your Beast-killer take the first hit and swap in and let your Dragonkin heal up before beating up on Dor. Depending on RNG, it may take a while to wear him down, but in the end, you’ll get him! Sure Hyuna, sounds like fun!